As we stand at the threshold of a new year, Jacqui and I want to say thank you for the innumerable kindnesses, support, and the way so many of you have rallied to our parish in this most unusual year. Because of both our Lord’s faithfulness and yours what could have been a devastating year has instead been one our our best years. This is truly a remarkable parish for which we are grateful to serve. Standing at the center of our parish life is our Lord and Saviour Jesus Christ. We have just celebrated this Word becoming flesh. As we look ahead to 2019 I hold up also the written Word that discloses to us the breadth and substance of our faith in the Living Word. If you are looking for a New Year’s resolution that will delight your heart and satisfy your soul, resolve to meet our Lord regularly through reading and studying his Word. To help you read the Bible in 2019, consider using one of the helpful Bible-reading plans below. Additionally, The Ridley Institute has planned several wonderful classes designed to help you grow in your knowledge and love of God. The year begins with Old Testament Foundations, a weekend intensive, January 10-12. 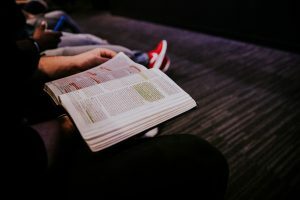 The course is aimed at the everyday Christian who has questions about the Old Testament and its relationship to the New Testament – and, indeed, to us. The intensive will be taught by Dr. Erika Moore, a gifted teacher from Trinity School for Ministry. You can find more about these courses along with registration information at RidleyInstitute.com. The point of all of this, friends, is to read the Word of God. Join me, won’t you, as we grow in knowledge of and in love with Christ Jesus.